Home » Blogs » Happy International Women’s Day! Today we are celebrating International Women’s Day, as well as National Social Work Month! As researchers within the realm of social work, we are constantly striving to unite the numbers with the stories— the quantitative and the qualitative— in order to comprise a more complete picture of the people we serve. We wanted to honor a woman who exemplifies social work and its principles, but we couldn’t pick just one woman who has made an impact on our field or the world. Rather, we believe that social work is most successful when a chorus of diverse voices, results, perspectives, and passions can gather, intersect, and expand upon each other’s work. So today, we would like to share the stories of five women. They have inspired advocacy, developed communities, and fought for human rights across the 20th and 21st centuries. Whether formally trained in social work or instinctually driven, these women have made a huge impact on the practice and policy that influences social work. Although Dolores Huerta was not formally trained as a social worker, her background is certainly one that aligns with the social work code of ethics. Huerta is considered to be one of the most influential labor activists of the 20th century, and a leader of the Chicano civil rights movement. She began her career as a teacher, but quickly changed to farmer advocacy work after seeing so many of her students from farming families who were coming to school hungry. Together with César Chávez, Huerta founded the National Farm Workers Association (NFWA), which was the predecessor of the United Farm Workers’ Association (UFW). She fought for better working conditions for farmers (including the elimination of harmful pesticides, as well as unemployment and healthcare benefits). In 1998, she was honored with the Eleanor Roosevelt Human Rights Award. Mariko Yamada was raised in inner-city Denver by parents that had been held in Japanese internment camps for four years during World War II. As a first generation college student, she went on to receive her MSW from the University of Southern California in 1974. “My joke is I studied psychology to save my family but realized that it would not work, so I pursued social work to try to save the world instead,” Yamada said (USC Suzanne Dwoark-Peck School of Social Work, 2008). Her passion for social justice led her to politics, where she became the chair of the Yolo County Board of Supervisors, which aids in the provision of health and human services resources. She went onto be an assemblywoman from California’s 4th Assembly district. Additionally, Yamada has served as an investigator with the Civil Rights Division of the U.S. Department of Commerce. Many people are familiar with Alice Walker as the novelist and poet most famous for her Pulitzer Prize-winning book “The Color Purple.” However, Walker has also been a social worker, teacher, and lecturer. Right after graduating from Sarah Lawrence in 1965, Walker went on to work with the New York City Department of Welfare. A year later, she moved to Jackson, Mississippi to work for the Legal Defense Fund of the National Association for the Advancement of Colored People, taking depositions from African Americans that had been evicted from their homes for trying to register to vote. Her Civil Rights advocacy work has been immortalized through her written words, now translated into over two dozen languages with over ten million copies sold. Cecelia Chung is a human rights leader who advocates for HIV/AIDS awareness and treatment access, LGBT equality, social justice, and ending violence across all communities. Currently one of seven commissioners in the San Francisco Department of Public Health, Chung chairs the Finance and Planning Committee. Originally from Hong Kong, she came to the United States in the 1980’s and was shortly thereafter diagnosed with HIV. She was a founding member of the Trans March, which has since spread to cities all across the US. In 2013, Chung was appointed to the Presidential Advisory Council on HIV/AIDS, and in 2015 she launched Positively Trans, a leadership development project that helps trans people of color living with HIV. Considered to be one of the “pioneers of social work” by the National Association of Social Workers, Ruby Gourdine is a professor at the School of Social Work within Howard University. Her research focuses on child welfare, juvenile justice, medical social work, school social work, and social work history. Outside of the Howard faculty, Dr. Gourdine has worked as a clinician, administrator, consultant, and researcher. Her combined experience in the field and in academia has enabled her to provide a unique perspective on social work services to both private agencies and the DC public school system, specifically on racial inequality, which is her area of professional expertise. 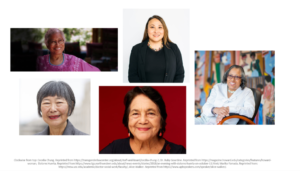 Dolores, Mariko, Alice, Cecelia, and Ruby are just five of many women who have changed things for the better within the field of social work. We hope these women inspire you to continue to do the work you do, supporting and promoting the wellbeing of children and families and of us all.